We can’t judge ourselves for our responses to trauma. A judgement is a cognitive (thinking) action. It doesn’t matter what we think should be easy to deal with or talk about, or how we think we should have responded. Trauma is registered in the body in the nervous system, so our responses to trauma happen subconsciously. That’s why we need to go at the body’s pace in recovery and learn to speak our body’s language. There are often a lot of misconceptions about therapy. Many of the therapy sessions we see in Hollywood films depict clients pouring their hearts out to silently nodding, onlooking therapists, usually wearing trendy spectacles. (I don’t wear spectacles. Yet.) While this approach to therapy does exist, it reflects a less frequently employed modality. It lends to the common idea that clients have to purge all details of their past to their therapists, sometimes within their first meeting! This can create an intense sense of pressure on the first meeting. But not all therapists or therapies are alike, and there are times when such cathartic monologues may be harmful; especially when trauma is concerned. That’s why it’s important to work with practitioners who specialize in trauma treatment, specifically somatic, or body-oriented, approaches, if you experience these types of concerns. To understand the importance of this, one must grasp how the nervous system works. When a person is confronted with something their brains and bodies perceive to be threatening (a stressor), their nervous systems automatically react with the stress response, putting them into a state of fight, flight, or freeze, and when these are ineffective, a submit or feigned death (dissociative) state. These are our natural survival mechanisms. Neurologically, during this process, our frontal cortex (or thinking/executive brain) and hippocampus effectively shut down. The evolutionary psychological explanation for this is simple: when we’re confronted with a potential life-threatening stressor, we don’t need to be eating a ham sandwich, reproducing, or thinking analytically; we simply need to mobilize our survival instincts to ensure our safety. And it’s for this very reason that top-down therapy approaches miss the mark when it comes to trauma treatment, because it’s at this level of functioning that we’re most affected by trauma. Thinking more about neuroanatomy, the frontal cortex, or “primate brain,” responsible for our executive cognition (thinking), uses verbal language and analytical reasoning; the mid-brain, referred to as the limbic system, or “mammalian brain” speaks the language of emotion; and the brainstem, or “reptilian brain” speaks the language of sensation and impulse (Ogden, 2002). There are psychotherapeutic approaches which address each part of the triune brain (the three subsections previously described), such as: CBT for the “thinking brain;” emotion-focused approaches for the “feeling brain;” and sensory-oriented approaches for the “sensory brain.” When we are traumatized, our brainstems are overwhelmed by the threat; the frontal cortex is compromised and we don’t fully encode or process the experience analytically or emotionally. Our trauma response gets ‘stuck’ in the body and continues to activate primitive parts of the brain, implicating impulses and reactions that don’t get fully ‘metabolized’ in higher-level cortical areas. That’s why we need to start with the body in trauma treatment in a bottom-up approach to address the impact of trauma that was stored somatically before we can facilitate subsequent emotional and thinking processes (which happen later in therapy). Somatic approaches help clients respect their personal limits, such as, how much they can comfortably tolerate in discussion before becoming flooded or overwhelmed. Such approaches incorporate the most recent advancements in the field of neuroscience and teach clients how to regulate their bodies to achieve greater personal safety…before going into the stories. It’s for these reasons that I stop clients from going into detailed accounts of their trauma histories during our first moments together. While my interruption may seem surprising, to allow them to continue may compromise their nervous system functioning and possibly retraumatize them. In my office, we’ll likely get to the trauma histories and move past them, if a client is ready; but we always go at the nervous system’s pace. [Article cited: “The Lifelong Effects of Early Childhood Adversity and Toxic Stress,” by Shonkoff and Garner, (2012)]. This is an excellent article that comprehensively outlines the connection between early childhood stress with disease and disorder in adulthood. Although highly scientific and medically focused, the implications this article point to (i.e. correlations between early life adversity and subsequent susceptibility to mental health concerns and chronic disease) needn’t be pathologized; rather, I see these biological changes merely as our body’s way of promoting a prolonged stress response to adapt to and survive difficult experiences. Certainly this can lead to increased disease, disorder, and/or morbidity later in life, but if we develop self-awareness of our weaknesses (i.e. an over-developed stress response), we can develop skills and strategies to overcome them. Thank goodness for neuroplasticity, neurofeedback, yoga, meditation, and psychotherapy which help to restructure our brains, rebalance hormonal and biochemical processes, and promote psychological resilience. (For example, mindfulness meditation has been shown to reduce grey (brain) matter in the amygdala (a neurological structure responsible for processing fear), thereby counterbalancing the implications of toxic childhood stress discussed here. As all of you know, Heartfulness Psychotherapy is offering a Mindfulness-Based Cognitive Therapy (MBCT) group this spring and has also recently been involved in offering neurofeedback treatment. As such, I was asked by some very clever clients the difference between the two treatments and the associated benefits to be gained from MBCT versus neurofeedback, which I thought was a really interesting question. So let’s get into it. MBCT is a particular type of mindfulness-based approach. It’s a manualized 8-week course that teaches techniques to manage difficult thoughts, feelings, emotions, stress, and pain to promote health and relaxation using guided meditation exercises. It’s not a therapy or support group per se, but rather an experientially focused group that encourages participants to try exercises and share their experience in group. Mindfulness is a practice. This is good news and bad news for some. It means that it offers life-long skills to manage life’s challenges, which is empowering! It means if you practice these tools, you’ll have access to long-term resilience and skillfulness for the rest of your life, and once you know the practice, it effectively becomes free (you can practice it on your own), or with minimal follow-up/ “booster sessions” required. It also means that it’s most effective if it becomes part of a lifestyle (i.e. if it’s done on a regular basis), which some people aren’t willing to do consistently. Neurofeedback uses EEG (electroencephalography) to get a baseline reading of the brain’s electromagnetic frequency waves such as delta, theta, alpha, beta, and gamma which may be over or under active in various brain regions, consequently affecting a range of functions. Based on the baseline reading of one’s neural activity, and based on their subjective reports about the symptoms or complaints they’re experiencing, a recommended treatment protocol is generated by the system. 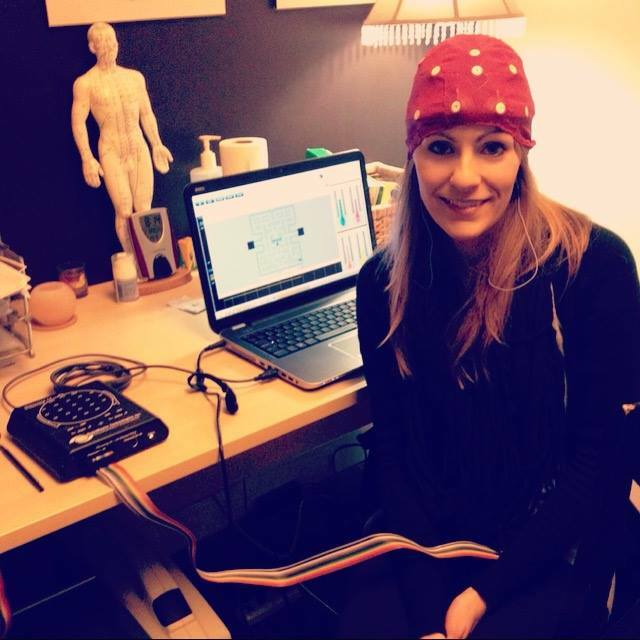 While neurofeedback systems may differ slightly, the overall premise behind their effectiveness is that they provide stimulation [in the form of auditory, visual, or tactile rewards (less commonly used)] to help the brain “train” or learn how to function at the healthier brainwave frequency for that particular brain region, as determined by the particular system. Every system is different. The technology I worked with compared each individual’s brain reading to a vast normative database, which has pros and cons in itself (e.g. some systems employ technology that only trains the brain in comparison to itself, since some people prefer not to have their brainwave frequencies modeled based on a normative sample, while others don’t mind). Neurofeedback is purported to have lasting effects that are produced within 3-10 treatments with a variable amount of follow-up required (on a case by case basis). It is often extremely costly but beneficial results can be seen relatively quickly, although the experienced benefits differ between individuals. MBCT also has lasting impact but requires maintenance for best results. While the 8-week course can cost generally $600 -$975, it tends to be considerably more economical than neurofeedback and/or individual psychotherapy. However, neurofeedback might appeal to those looking for a ‘quick fix,’ which tends to be attractive in our fast-paced society. Neurofeedback reflects new technology and all the benefits and limitations that come along with it, while MBCT has its origins in ancient Eastern traditions, thus carrying a sense of tried and true organic wisdom. Mindfulness empowers individuals to cultivate internal skills and control whereas neurofeedback requires that patients be dependent on the skillfulness of the practitioner and the particularities of the technology being employed, thereby relinquishing personal agency. Neurofeedback is intended to result in lasting neurological change. The number of brain regions “trained” or targeted during a 10-session treatment protocol largely depend on the particular system being employed. I trained on a system using four regions (i.e. during my treatment, I consistently worked on improving four brain regions). The neural regions selected were determined partly by the clinician and partly by the treatment protocol generated by the technology. Therefore, while there is greater ability to individualize which brain regions (and which associated symptoms) will be addressed by neurofeedback, there are often a limited number of options. Of course one could choose to pay for subsequent treatments and train additional regions. Mindfulness meditation (and MBCT) affect significant beneficial brain changes too, (see Psychology Today’s listing and Harvard’s recent study) they’re just less individually customizable. Such practices affect the brain’s electromagnetic frequencies as well; again, they’re just less individually customizable than in neurofeedback treatment. MBCT has few (if any) contraindications and to my knowledge has not been known to cause harm to anyone. Neurofeedback on the other hand is contraindicated for various conditions (e.g. epilepsy), and can be harmful if the clinician implementing it is not properly trained. Since MBCT is manualized, it should theoretically be offered in a consistent manner irrespective of the group facilitator. Neurofeedback, however, may vary depending on the technology employed and operating clinician. Both approaches require prolonged sitting (20-40 minutes). Both approaches can make people feel slightly sleepy afterward. MBCT requires approximately 1.5 – 2 hours a week commitment for an 8-week period, while neurofeedback generally requires a one hour assessment, a 30-minute report reading, and 2-3 20-minute subsequent training sessions a week for a minimum of 10 sessions, thus neurofeedback is more time intensive. And it involves hair gel that may hamper your plans if you have a date scheduled after your appointment. Just saying. MBCT is offered amongst groups, while neurofeedback is offered individually, thus providing a greater sense of privacy during treatments. While some may shy away from groups, I’ve received a surprising amount of feedback suggesting that the group atmosphere helped individuals learn from one another, normalize their own experiences, and feel part of a supportive community. (Note that speaking in group is only voluntary). Nevertheless, it remains up to personal preference. I prefer MBCT over neurofeedback because I like the self-empowerment, life-long skill acquisition aspect of it rather than feeling dependent on yet another service provider. It helps me feel greater alignment with my spirituality, (note: this component is NOT taught or required in MBCT groups but may be an pleasant and optional byproduct). It also supports my yoga practice since it incorporates some gentle yoga postures. Overall, both approaches are great non-medical alternatives, and both treatments are known to be helpful for a variety of concerns, so it all depends on the treatment outcome you’re looking for. Ideally, we should be so lucky to use both treatments! Please note that this is my professional opinion on these practices based on my experience with them; feel free to offer your feedback if you feel I’ve missed something; I’m happy to start a dialogue. Happy brain health everyone! Negativity is often a lot about being in a protective, defensive state of mind. Evolutionary psychologists believe negativity served an important adaptive evolutionary function: it helped keep our ancestors alive long enough to procreate succedent generations of offspring to eventually produce you and me. That’s how researchers explain the negativity bias: the fact that it takes us about 20 seconds longer to encode positive thoughts or memories than we do negative ones. It would have been advantageous for our ancestors to attend to negative, possibly threatening events in their environment, such as floods, droughts, competing tribes, or dangerous packs of animals nearby, as this would have increased their chance of survival and reproduction (i.e. the goal of our genes). This negativity bias formed the foundation of our cognition (i.e. human thinking processes and associated neural/brain architecture), thus shaping how we think in modern life, since we still share the same cortical architecture as our forbearers. Identify the negative thought. Awareness is always the first step. Labeling it as such can help increase your awareness when it arises. Note the underlying function the worry/thought is serving (e.g. it likely has your best interests at heart). E.g. the subtext might sound like: “Be careful not to get too excited and become disappointed”…or “If I anticipate bad things will happen, I will be less hurt if/when they do occur,”). Give yourself permission to adopt new perspectives. You might even thank the negative thought, for example: “thank you worrisome thought for wanting to protect me from pain. I know you’re just trying to keep me safe, but I’m going to give myself permission to try seeing this differently…”. You might remind yourself that changing a habituated pattern may feel uncomfortable at first, but that’s often a sign of breaking the rut, and remind yourself of the good reasons for doing so. Sometimes we can get used to living in a certain state (e.g. unhappiness or stress), and need to consciously practice allowing ourselves the freedom to experience levity and optimism. Become an observer: watch your thoughts like passing clouds in the sky; notice that they are fleeting if we do not hold onto them or endorse them with rumination, and that eventually they will be replaced by new thoughts (e.g. about what to have for lunch!). Adopt a regular mindfulness practice as a way to disengage from troubling thoughts. If you’re new to mindfulness, seek out guided meditations online or in the app store. Pick a mantra; any mantra. Kundalini yogis swear by repeatedly reciting uplifting mantras (aloud or internally), as they help reprogram our subconscious minds, rewiring us towards positivity and healing energy, or at the very least, acting as a welcome mental distraction. Surround yourself with positive people. They say we’re the sum of the five people we’re closest to. Who’s in your inner circle? Adopt a gratitude practice. Start keeping a written list of a few simple things you’re grateful for daily (there are apps for this!). It will shift your thinking to help you become better at recognizing and cultivating more pleasurable events. Channel your inner 4-year old. You might envision yourself experiencing situations from fresh eyes the way children do. Use your sensory information to ground you in the present moment and stimulate your imagination. Try to savour the experience you take in through your senses. Allow yourself to experiment with different sensory stimuli. Play and feel fully alive. Spend time savouring small moments. By elongating your experience of pleasurable events, you’re more likely to reap their benefits and store them in memory for later. Do the opposite. Mindfully choosing to do opposite action (or respond differently) can be helpful if you’re in a pattern that’s not working for you and you’re not sure how to break out of it. We usually have to change our behaviour to change the trajectory of the pattern, which reflects our ability to influence our circumstances and be empowered! This can be applied to relationships and other challenges. A good example is trying to break out of a depressed rut. Depression often causes a lack of motivation and increased isolation; but fighting against these impulses to hibernate can actually generate improved mood. Be mindful about the opposite actions you choose; ensure you’re choosing activities that are known to have a beneficial affect on you. Consider the evidence for and against your negative thought. Make a list for both. Often there is more evidence supporting the contrary. Practice reframing. Your reframes don’t necessarily have to be positive. Not everyone has a positive alternative thought handy, but just adopting an alternative perception could be enough to affect an emotional shift. Adopting other perspectives also reminds us that our original automatic interpretation is not a veridical truth, but rather, just one of many points of view, and we can switch them if we choose to. Work with a professional. This can be hard work to do on one’s own when you’re already entrenched in a certain way of thinking or functioning. Therapists can be helpful catalysts for fostering movement out of old patterns. A good therapist should be a neutral observer, and they should create a sense of accountability in clients, gently motivating and supporting them through challenges. Keep practicing. New habits take time! Although the holidays can be a special time of year, they can also bring increased pressures, demands, and expectations, leaving many feeling overwhelmed. To help you get the most of the season, we’ve compiled a list of ways to mitigate holiday stress. Anticipate extra errands when planning for guests and gifts and try to pencil time into your schedule well in advance. Expect and strategize for additional deadlines at work before the holiday break. Arrange specialist appointments reliant on extended healthcare coverage well before the end of the year when appointments become scarce. To fight off procrastination, make a list of simple, manageable steps needed to address each task and set reminders in your daily agenda, use visual cues (e.g. on your fridge) if you’re a visual person, or schedule timed reminders in your phone. Many people report feeling a sense of satisfaction and relief when checking off listed items, which helps maintain motivation and organization. Likewise, intentionally schedule extra time for relaxation and self-care activities since they’re likely to be overlooked when they’re needed most. Mindfulness (i.e. increased awareness of one’s thoughts, feelings, and sensations in an accepting, nonjudgmental manner) helps us better identify our triggers and manage them before they lead to mental, physical, and emotional exhaustion. Although it’s a hectic time of year and one of the most common complaints from clients is a lack of time to devote to meditation or relaxation, short grounding exercises can fit into any hectic schedule and can have a lasting impact. For instance, three times a day, take a three-minute breathing space to check in with your thoughts, feelings, and sensations while tuning into the rhythms of your breathing. Use this time to note anything your body is telling you. Have you forgotten to eat properly? Do you need to get some extra sleep? Do you need to fit in a quick walk? If time permits, you can explore longer 10-30 minute meditation exercises. Research has shown that three 15-minute meditations weekly can reduce depression and 30-minute meditations daily have been shown to reduce grey matter and activation in the amygdala, a brain region associated with anxiety and stress. By decreasing our stress hormones, meditation also helps maintain a stronger immune system to help us thrive throughout the holidays. With so much emphasis on social gatherings, the holidays can also present poignant reminders of one’s lack of familial ties and supports, and romanticized ideologies around celebrations like New Years Eve can have the affect of making one acutely aware of their relationship status (if single). Or perhaps the holidays bring up difficult anniversaries. If you know this is a difficult time for you, build a support network. Reach out to friends, get professional support, or join a community group. Schedule purposeful activities with friends on difficult anniversaries to ensure you’ll have the supports you need. Or find a way to cultivate gratitude. Whether through journaling or sharing with others, research has shown that practicing gratitude has health benefits, such as decreased depression and longer and better quality sleep. Also, finding a way to give back to those less fortunate (e.g. through volunteering) can redirect us from focusing on our own problems and increase a sense of purpose, community, and connection in our lives.